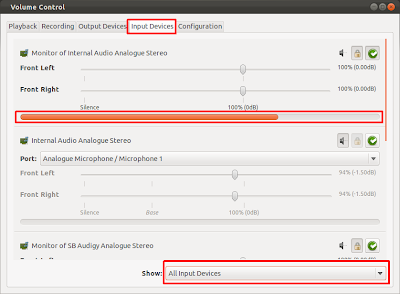 PulseAudio Volume Control (pavucontrol) is a simple mixer for the PulseAudio sound server. In contrast to classic mixer tools this one allows you to control both the volume of hardware devices and of each playback stream separately. 4) Launch Audacity and press record. 5) Back in Pavucontrol under the Recording tab you should see Audacity recording and the interface it is currently monitoring. 8) Now you're ready to record away. 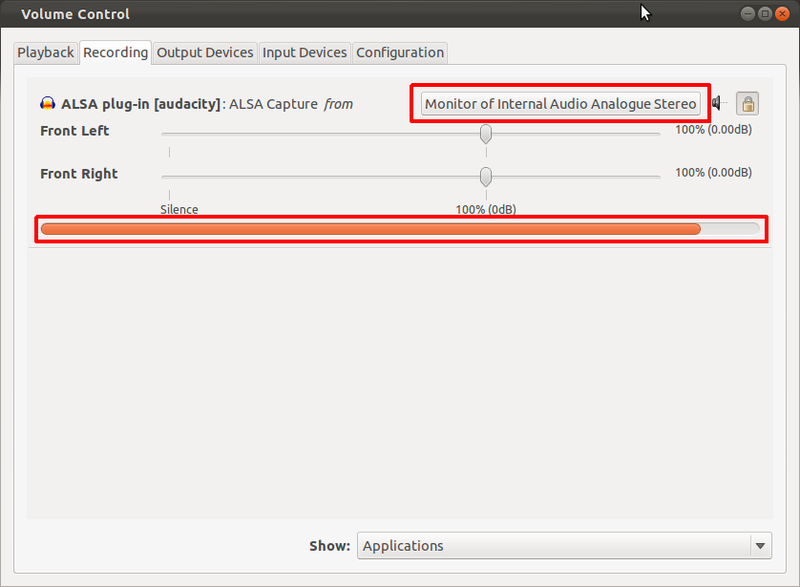 Some thing that is worth checking is that in Audacity the project sample rate is set to that of your recording source. Sweet! 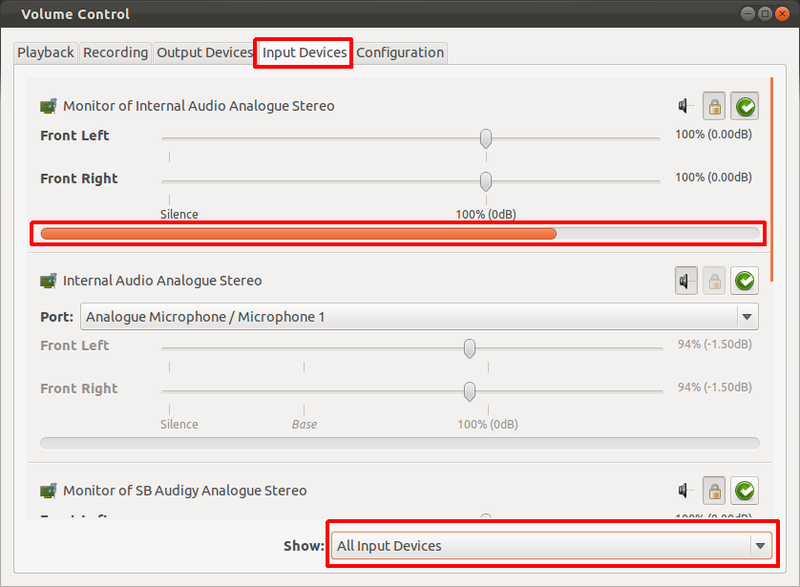 Just installed Ubuntu 12.04, followed by Audacity. I need to record some old cassettes for the father-in-law and your set-up worked perfectly! By the way, my set-up also use "default:line 0" as the correct input. Thanks for posting this. thanks a lot! clear, concise, and ... it works like a charm. It actually flippin works ! Perfect! 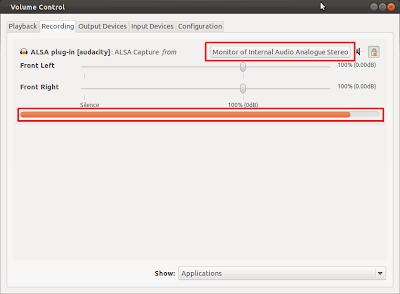 I only had to add one extra step: going to "Configuration" and setting it to "Analog Stereo Output"
I needed a simple, straightforward explanation and that is exactly what you provided! You saved my musical soul! Thanks for posting! Holy crap! What Chris said, only louder. And almost a year later! Works great, thanks for the detailed instructions. Why does the recording come out sounding slower than the original source when I record with pavucontrol from the sound card output? Mathew Presti - if your pitch is lower, it may be due to a discrepancy between the sampling rate in Audacity and the playback rate in your source. But it's easy to fix in Audacity - just go to Effects > Change Pitch and, for an increase or decrease of one musical tone, just add 8 or -8 respectively. Great blog post ConfoundedTech - been here a couple of times. Cheers! Still good for 16.10 LTS ... a few years down the line! Couldn't find instructions this simple and successful (key combination -- especially the latter!) on AskUbuntu. Thanks! It is very simple and easy to understand. Thanks.